Shane Shirley : Latest News on What Really Happened to the LeRoy Girls - 2 Girls Cured! 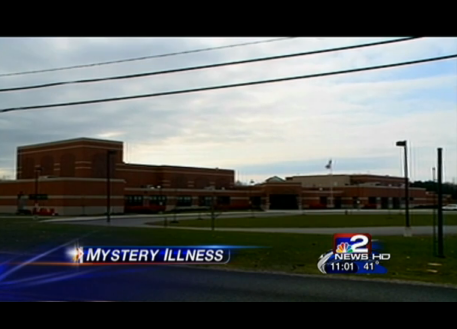 - 12 Girls Sick in LeRoy, New York. Fall Ill with Neurological, Tourette's Like Symptoms. Concerned Community and Parents Want Answers. 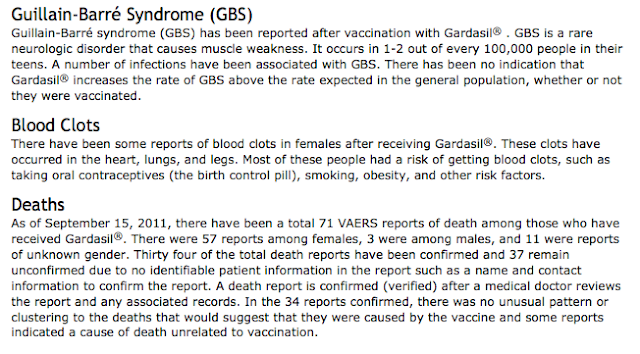 Could Gardasil Vaccine or Toxic Dump Be to Blame? Latest News on What Really Happened to the LeRoy Girls - 2 Girls Cured! 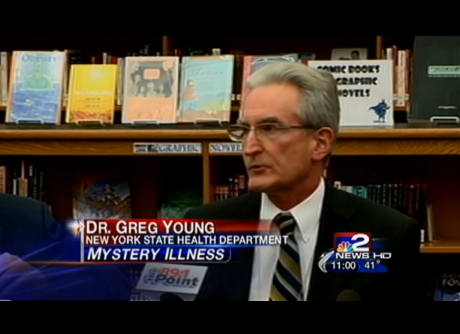 - 12 Girls Sick in LeRoy, New York. Fall Ill with Neurological, Tourette's Like Symptoms. Concerned Community and Parents Want Answers. Could Gardasil Vaccine or Toxic Dump Be to Blame? A dozen girls who attend the same school in LeRoy, New York have fallen ill with a neurological illness which manifests itself in Tourette's like symptoms of tics and uncontrolled spasms. During a meeting Wednesday night at LeRoy Junior-Senior High School, representatives from the state health department, the Western New York Region of the State Office of Mental Health and the school superintendent Kim Cox had no answers for a very concerned community. The girls began falling ill last September and, so far, doctors have been unable to tell parents of the ill girls or the public what has caused the 12 girls' symptoms. Dr. Gregory Young from New York State Health Department says the girls have been diagnosed, are being treated and are getting better. Parents of the sick girls and at least one of the girls say otherwise. Dr. Gregory Young, Associate Commissioner of the State Health Department said, "We have conclusively ruled out any form of infection or communicable disease and there's no evidence of any environmental factor." Still, Young says there is a diagnosis but also tells the public that it is a "national matter" of the HIPPA laws that is preventing them from divulging the diagnosis of the 12 LeRoy High School girls. Though Dr. Young and the health department say there is a diagnosis, a father of one of the ill girls Jim DuPont says otherwise. He also says that even he has not been told why his daughter and the other girls fell ill, as state health officials are keeping the true cause under wraps. "Want to know something? If my daughter had a diagnosis and I knew about it, and I would as her parent, I would tell you that!" said DuPont to local new station WHAM 13. "These girls all go to the same neurologist and there is no diagnosis. They don't know what's causing it. That's why we're all here at this meeting." One of the sick girls from LeRoy contacted news channel 10 WHEC in Rochester, NY and told them she still has not been diagnosed. She said she is still blacking out and has missed three months of school. She said her doctor told her "it's something neurological that they can't figure it out yet." "My frustration is until September 10th of 2011 I had a healthy girl, a girl that was in junior high who loved school had a lot of friends, was very happy high honor roll and then all of a sudden she wakes up from a nap and she's twitching out of control," said Beth Miller, mother of one of the girls who has been sick since September. One doctor told Miller that her daughter might have Conversion Disorder which is a neurological problem brought on by stress. Oddly though the symptoms of Conversion Disorder include symptoms the girls are not experiencing such as the inability to speak, paralysis, numbness and blindness. Miller and Dupont are starting a support group for all of the parents in hopes of finding answers through collaboration. 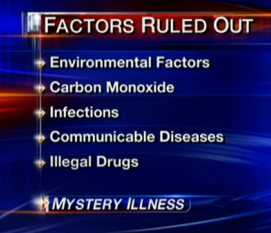 Possible factors remaining as causes given by health officials but is one factor missing? One obvious cause remaining would be a neurological illness brought on by the human papillomavirus (HPV) vaccine called Gardasil. Post Gardasil Syndrome, can manifest itself in many ways including neurological. You can see from the excerpt above that Guillain-Barré, the illness my father contracted after taking a Hep-b vaccine, has been reported after the Gardasil vaccination. There have been a myriad of other neurological problems anecdotally reported as well. The problem with this scenario is that, as far as I can ascertain, none of the parents have said anything about their daughters receiving the vaccine. "You feel frustrated and helpless because you don't know what you can do." said father of sick girl, Jim Dupont. I will keep you updated on this story as I get more information. Please leave a comment below if you have any news or if you want to add your theory as to what you think is causing these poor girls to suffer. 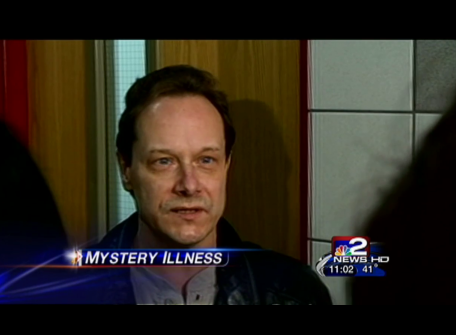 Update 1-16-12: An article dated 1-12-12 on WGRZ.com states,"NYS Health Department spokesman Jeff Hammond also says vaccines such as Gardasil were investigated as a cause and ruled out." Considering how information we have been receiving on this story has varied greatly from what the state says compared to what the parents say, I am not sure it is accurate. Please also take a look in the comments though as there is another girl in another state who is experiencing, what appears to be, the same symptoms. The comment states that her daughter had the Gardasil vaccine last year. As far as I know, vaccine reactions usually occur within a relatively short period of time from receiving the vaccine. Update 1-17-12: This morning, two of the girls afflicted with the Tourette's like illness spoke with Ann Curry on NBC's Today Show. Seventeen year old Thera Sanchez appeared with her mother Melisa Phillips and 16 year old Katie Krautwurst was accompanied by her mother Elizabeth Miller. You can only feel compassion for these strong, young girls and their obviously devoted mothers. Cheerleader, Thera Sanchez says she's angry and very frustrated that no one is giving answers. Thera's friend Katie says she's angry too. Who can blame them? But finding out where to place the blame is seeming to be illusive. Referring to the New York State Health Department's statement from to Dr. Young that there are no environmental factors or infectious diseases at fault, Melisa Phillips said, “Where’s the proof? Where’s the data? Where’s the testing? When has this been done? Nothing's been collectively done for our daughters. Everything has been done individually. Testing they say that all the girls have had, they have not had. The facts that they're stating, just aren't true." Update 1-20-12: Dr. Laszlo Mechtler, a neurologist in Amherst, N.Y., who is treating some of the sick girls from LeRoy told TODAY on Wednesday that the diagnosis of conversion disorder is the correct diagnosis. Another name for conversion disorder is mass hysteria. Although the term mass hysteria lends itself to the idea that the illness is made up, it is not The symptoms the girls are experiencing are real. Conversion disorder symptoms usually occur after a stressful event, although a patient can be more at risk if also suffering from an illness. Symptoms may last for days or weeks and can include blindness, inability to speak, numbness or other neurologic problems. "It's happened before, all around the world, in different parts of the world. It's a rare phenomena. Physicians are intrigued by it," Dr. Mechtler told TODAY. "The bottom line is these teenagers will get better." 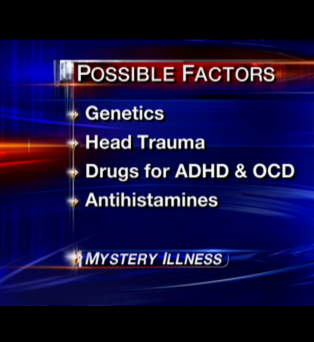 Update 1-27-12: Two more girls and a boy are ill with the same type of symptoms as the first 12 sick girls. Parents of six of the girls from LeRoy Junior-Senior High School in New York met this past weekend and agreed they want some sort of cohesive team, perhaps one physician, who has expertise in this area. Last Friday two of the initial 12 girls suffering from the Tourett's like illness, Thera Sanchez and Lydia Parker, appeared on HLN's "Dr. Drew". "I'm not good -- not today -- my tics got worse,” Sanchez said in the interview. Dr. Laszlo Mechtler, a neurologist in Amherst, N.Y., who is treating some of the sick girls from LeRoy clarified that he and another doctor diagnosed the first girl who came to them as having Conversion Disorder. Dr. Laszlo Mechtler said they were shocked when more girls kept showing up in the next 2-3 months. Now in the last 5 days, 2 more patients have come forward with the same symptoms and USA Today reports that a boy has fallen ill as well. Still, Dr. Mechtler says that each patient must each be evaluated individually. Dr. Mechtler has not evaluated all of the girls. Dr. Rosario Trufelleti, who is traveling to LeRoy to meet with some of the girls ans their parents this weekend, believes the diagnosis of Conversion Disorder was "garbage" and believes it is most likely P.A.N.D.A.S. The non-cohesive approach to discover what caused the girls illnesses and ho, along with the fact that the doctors disagree on the diagnosis, pushed the parents to continue on their quest to connect and use their collective power to find help for their daughters. Last weekend, parents of six of the girls from LeRoy Junior-Senior High School in New York met and agreed that what they want is some sort of cohesive team, perhaps one physician, who has expertise in this area. Dr. John Sharp, a Harvard Medical School Psychiatrist, has offered to support each individual girl's treatment, while looking at the girls each as a piece of a whole. Furthermore, Erin Brockovich who was made famous by her crusade against hexavalent chromium in the 90's, told USA TODAY that at the request of local residents, she is looking into a 1970 train accident that spilled cyanide and an industrial solvent called trichloroethene close to the site of the Le Roy, New York school. Brockovich told USA Today that, "We don't have all the answers, but we are suspicious." USA Today also reported that at least one boy has now come down with similar symptoms. Update 1-31-12: As I reported earlier, Erin Brockovich has been called in to try to investigate whether a nearby chemical spill from a 1970's train derailment might have anything to do with the Tourette's like symptoms the 15 LeRoy, NY teens are experiencing. Interestingly, Brockovich's associate and environmental investigator, Bob Bowcock was told by the school district that the school would not allow him to take any samples of soil and water samples on school grounds. Superintendent Kim Cox said that they had tested the school already. When Bowcock checked out the actual derailment site, he was surprised to find 55 gallon drums rusting away and leaking material into the ground. "Draw your own conclusion." he said. “Well, if they`re not going to let them get a couple of samples, they should know that it makes them look like they`re trying to hide something,” said Lydia Parker who is one of the afflicted teens. Brockovich says people have written to her that live in the area with similar medical problems. In a 1-31-12 afternoon news release, A request for an environmental investigation was made by the Center for Health, Environment and Justice and the Healthy Schools Network, both based in the Washington, D.C., area, and the Empire State Consumer Project. The trio noted the presence of five natural gas wells around the school, three locations in the town where toxic chemicals were released in the past, and cited rampant rumors that rock or soil from one of the sites was used on school property. Parents of two of the ill girls joined in the call for the New York state Health department, environmental and education agencies, the EPA and the LeRoy Central School District to arrange for testing. “We are overwhelmed by the complex problems now facing too many families and their affected children. We hope that full, appropriate, and speedy investigations will help prevent more illnesses,” said the Le Roy parents, Jim Dupont and Beth Miller, in a written statement. Update 2-1-12: An adult woman has recently come forward who began experiencing the same Tourette's like symptoms last September, around the same time as the initial 12 ill girls. Marge Fitzsimmons, 36, who says she has to have faith in her doctors, was diagnosed with conversion disorder brought on by stress and childhood trauma. She seems to want the diagnosis to stand because if it is environmental, she feels she may have no hope of getting better. As a teen, she played in a quarry near the site of the toxic train spill in the 1970's. In another development, one of the father's of the ill girls (who did not want to be identified) has taken pictures of people in trucks from Paragon Environmental Construction inspecting the barrels at the train derailment site. He said they lifted lids and kicked some of the rusty, leaking barrels. Another vehicle arrived with over 15 coolers which they put inside of the construction trailer on the site. "This is it. This is why my daughter is sick. I know it is. And what scares me is there is no cure." he said. Today, Brockovich associate and environmental investigator Bob Bowcock appeared on HLN and said, "Apparently somebody at EPA dropped the ball or EPA - the institution - dropped the ball in not physically supervising the site." Is the EPA to blame? Where is Lisa Jackson, head of EPA, in all of this? It certainly is of concern to think that the EPA has left 55 gallon drums of toxic chemicals rusting away and seeping into the ground in LeRoy for decades. The EPA is aware of the parents and community's concerns and we are working closely with the school district and all of the involved state agencies to give them information related to the Lehigh Valley Derailment Superfund site about 4 miles from the school. While EPA is gathering information about actions that took place at the Lehigh site before the site became a federal Superfund site, we do not believe pollution from either site is impacted the school. As we gather all of the facts, we will keep the community, our state partners and the school district up to date. In addition, there is another Superfund site about 10 miles east of the school that EPA also believes has no impact on the school. At this point, we are still gathering some information and don't have anything to add to what we said yesterday. The one new item is that we are sampling drums as a first step to moving them off the site. Once we have that data we will share it. The last several months have been challenging for the community of LeRoy. While we are all are anxious for answers, it's important that we allow medical and environmental experts to collect the facts and accurately identify the source of this unusual and unfortunate situation. Our top priority must be to protect the health and safety of the community of LeRoy and to this end, my office has been in contact with various federal agencies, like the Centers for Disease Control and Prevention and the Environmental Protection Agency. As a Representative of this community, I'm committed to ensuring that the residents of LeRoy have access to the resources needed to fully understand this situation." We at the Dent Neurologic Institute understand the concern and fear that the patients and their families are having in regards to the diagnosis that has been established. We also appreciate the input of any credible expert, as long as it is in the best interest of our patients. Their health and well-being has always been our primary goal. While this is a difficult time for all involved, it is equally important that the media's coverage of this matter be handled sensitively and responsibly with due consideration for our patients privacy and well-being. Kim Cox, the superintendent of the Le Roy Central School District, is referring media inquiries on medical and environmental questions to the experts from the New York State Department of Health, the New York State Department of Environmental Conservation, and the Environmental Protection Agency. They are best equipped to answer your technical questions, as they have ours. As has been communicated, the District has been working closely for months with numerous medical professionals, the State Department of Health, the State Department of Environmental Conservation, and the Environmental Protection Agency. All of these agencies and dozens of professionals from these agencies have assured the District that the school is safe. There is no evidence of an environmental situation or infectious cause. In addition, to help assist the District with assessing all aspects of this situation, it hired its own independent environmental expert to conduct a review of the findings and offer alternative approaches if needed. This was done not because the District questioned the state medical professionals or federal agencies, but to help reassure the community. There are also some who are attempting to marry the 1970 derailment to the school when in fact the plume has been shown as moving in the opposite direction some three miles away. The Le Roy community should take assurance that the Department of Health concluded extensive reviews of both the epidemiology and the clinical evaluations and found no evidence of environmental or infection as the cause of the students' illness. An environmental exposure would affect many people. The treating physicians ruled out PANDAS. The school was tested for Volatile Organic Compounds (including TCE) by an independent firm. The school is served by a public water system. The Gardasil vaccine was ruled out because many of the girls did not receive the vaccine. The Department of Environmental Conservation reaffirmed the evaluation that there is no evidence of environmental factors. The District will certainly welcome input from outside experts if they choose to offer it in a professional and constructive manner. It will rely on its own expert as well as counsel from the Department of Health, DEC and EPA as to whether any further testing is deemed appropriate. However, in the event that it is recommended, it will be done with a specific plan based upon all available information and accepted scientific protocols. The District wants to be clear that it has confidence with respect to the conclusions of the Department of Health based upon its comprehensive review of this situation as well as the assessment of the physicians at the DENT Neurologic Institute. The Le Roy Central School District and the Leroy community want what is best for the children in the schools. Unfortunately, the endless speculation without factual basis is creating an extreme level of anxiety and concern. Students are unable to focus on learning. The constant attention has had a negative impact on the recovery of some of the students who are directly affected, many who were improving and whose symptoms have now become exacerbated. The District knows this has been an emotionally hard situation on the community and everyone hopes for the speedy recovery of its students. Update 2-2-12: It seems that Superintendent of LeRoy Central School District, Kim Cox, is getting a little over the environmental toxin theory as the culprit to the Tourette's type illness affecting her students and others in the community. Oddly, she also seems to want Brockovich and her associates out of town. Check out the following statement she released yesterday. Over the past few days, activities that have occurred in our community with respect to environmental testing by a representative who claimed to be working on behalf of Erin Brockovitch have taken center stage. This has been a distraction and taken us away from our mission to return normalcy to our school District, which every medical professional says is critical for the health and well-being of all students in our schools. As we have communicated, we have been working closely for months with numerous medical professionals, the New York State Department of Health, the New York State Department of Environmental Conservation, and the United States Environmental Protection Agency. All of these agencies and professionals from these agencies have assured us that our school is safe. There is no evidence of an environmental or infectious cause. Environmental causes would not discriminate. We would see a wide range of people affected. The community should take assurance that the Department of Health concluded extensive reviews of both the epidemiology and the clinical evaluations and found no evidence of environmental or infection as the cause of the students’ illness. Again, an environmental exposure would affect many people. The school was tested for total Volatile Organic Compounds by an independent firm. The school is served by the Monroe County Water Authority. This system is monitored on a regular basis. In addition, we have just been informed that water samples taken from the inside of the school as an additional precaution have been tested and determined to be safe. The treating physicians at the Dent Institute ruled out PANDAS (Pediatric Autoimmune Neuropsychiatric Disorders associated with Streptococcal infections), a condition that sometimes causes this behavior. The Gardasil vaccine was ruled out because many of the girls did not receive the vaccine. In addition, to help assist the district with assessing all aspects of this situation, we hired our own independent environmental expert to conduct a review of the findings and offer alternative approaches if needed. This was done not because we questioned the state medical professionals or federal agencies, but to help reassure the community. There are also some individuals who are attempting to connect the 1970 Lehigh Valley Railroad train derailment that spilled Trichloroethene (TCE) to the school. In fact, the TCE plume has been shown as moving in the opposite direction of the school, some three miles away. The individual who came onto school property this past Saturday did not identify himself, did not show his credentials, and did not contact us ahead of time to offer assistance or coordinate with our efforts. Nor did this individual demonstrate that the testing approach was in accordance with scientific methods. It was clearly staged as a publicity stunt with members of local and national media invited to participate. We know this because the media arrived well in advance of this individual. In fact, one member of the media entered the school without permission and interrupted the preparations for an on-site program. Of course they were asked to leave. I am charged with keeping this entire school, staff, students and grounds safe. Not knowing this individual’s intention, I had no idea if he was there to get something or leave something. Our administration and staff are exceptional and have been diligently working under stressful situations to try to maintain a supportive educational environment. This has been extremely challenging given the irresponsible tactics and programming by the national media. Speculation and reporting of erroneous information by those who have none of the information that has been compiled over months of study by leading professionals is confusing our community. It is also heightening the level of anxiety of all our students and especially jeopardizing the recovery of those affected students, many who had recovered or been showing signs of improvement. These kids want to get better. As a community, we need to support each other and these students by ensuring our school environment is nurturing and safe. I want to thank the members of our local media who have been engaging in responsible reporting. I know we all want what is best for the children. We are all frustrated, tired and saddened by this turn of events as it is affecting the entire community. I am confident we will work through it, but I do believe it will take some time. My role as Superintendent of this District is to ensure I am providing the best possible educational environment conducive to learning and allowing our children to excel to the best of their ability. I am not an environmental scientist or medical professional, and therefore, cannot always be the spokesperson for highly technical and medical explanations nor answer questions that require in-depth technical knowledge. Questions of this nature must be addressed to those professionals and answered by these professionals. I have been trying to increase the direct communication from these agencies as well as putting forth new information as it is received. I know it is frustrating not to have definitive answers or wait for test findings. I want to assure you that all technical professionals involved are doing everything they can to expedite the process and communicate any new information as it is received. I know this has been an emotionally hard situation and we all hope for the speedy recovery of our students. Please know we welcome your questions and suggestions, and take all under consideration. We will continue to communicate with you as soon as we have new information to share. Update 2-6-12: A meeting was held Saturday at the school for parents, students and concerned community members. Below is a follow-up message to the meeting from Superintendent Kim Cox which was posted on the school website. It seems that the community is very concerned that the illnesses are caused by an environmental cause resulting from the 1970's toxic spill due to a train derailment while Cox is adamant that it is not environmental or contagious. The school has agreed to more testing on school grounds of the air but the parents want more environmental testing done on the school grounds. "Thank you for attending our meeting on Saturday, February 4, 2012, to review the preliminary recommendations by Leader Professional Services, our environmental consulting experts. I wanted to follow up on several questions that were asked at the meeting today. 1. The Department of Health has now issued a comprehensive written report of their investigation and findings of the Investigation of Neurologic Symptoms Among Le Roy Jr./Sr. High School Students. A link to the report is attached here. I encourage you to review the report as I think that it will help you to understand the comprehensive factors assessed relative to this situation and why the District has confidence in Department of Health’s conclusions. We understand that some are frustrated that the report was not released before now. Please understand that the District requested that the report be released long before now and we were not in control of the timing. 2. I understand that some are upset by the fact that the District has not already done soil testing. Soil testing is not simply taking shovelfuls of dirt and analyzing them in a lab with results coming back in less than 24 hours. The reason why Leader Professional Service has recommended that more extensive air sampling be done as an initial step is because the data obtained from such air sampling is critical to the development of an effective work plan for soil sampling. Based upon that data, crucial decisions will be formulated on what to include in the sampling plan. These include such things as: what compounds to look for, where to sample on the property, and how deep to dig the samples, among others. Without such a plan, as well consideration of other pertinent information, no one can have confidence in the results. This link is to the Preliminary Proposal Summary from Leader. The final recommendations report will be posted on Tuesday, so Leader has an opportunity to consider suggestions raised at the meeting. 3. I also need to be clear that contrary to statements made at the meeting, when we were contacted by outside individuals regarding their interest in becoming involved in sampling, we responded directly and promptly. We have stated that the District will certainly welcome input from outside experts if they choose to offer it in a professional and constructive manner. It is prudent and reasonable to require people to follow standard protocols. We will forward such information to our own consultant, Leader Professional Services, for assessment as they proceed with recommended testing and additional analysis. 4. At the District’s request, the DEC provided answers to frequently asked questions about the gas wells on the District’s property. A link to that document is attached [below] here. In addition, I can tell you that the District uses natural gas from the Medina rock formation from wells constructed in accordance with regulatory requirements. The gas is processed by adding mercapatan (the distinct odor associated with natural gas) and by separating brine water (saltwater) from it. No additional processing is required, as gas produced from the Medina rock formation does not contain other substances requiring removal in order to be safely used. The gas produced from the wells is piped into an airtight, self-contained delivery system, and is not released into the air inside or around the school. Natural gas from the Medina rock formation and the system used by the District to distribute it are used by many other schools and residences in this part of the state. A question was raised about a leak from a brine (saltwater) tank. That leak was identified through an inspection and was promptly corrected. No regulatory violation or fine was issued. In closing, we have worked for the past several months with experts and professionals both medical and environmental to better understand this condition. Extensive research, examination, and testing have revealed that there is no environmental or infectious cause for this ailment. Environmental causes do not discriminate. We would see a widespread impact across all age groups and genders. Misinformation, speculation, and erroneous facts have caused great concern and have distracted us from our mission of getting our students well and restoring a sense of peace and normalcy for all students so they can continue to learn. We knew we needed to further assure our community and so we engaged Leader Professional Services two weeks ago to help us accomplish this goal. Again, I would like to thank all of you who could attend this meeting. We will continue to update you as we progress through his process. I want to reiterate the health, safety, and well being of all our students is my, and the district’s, number one priority. My loyalty is to the students, staff, and community of Le Roy. I am firmly committed to ensuring that the school is not only safe, but protects the emotional well-being of our students, and promotes an atmosphere most conducive to learning." Update 2-7-12: The website sott.net reported yesterday that, after speaking with Bryan Tremblay, a man in Bath, about 70 miles away from LeRoy, who came down in September with the same type of Neurological, Tourette's like symptoms as the first 12 girl afflicted in LeRoy, they have a new theory. Perhaps the cause of the outbursts, twitching and uncontrollable movements in the afflicted is caused by ergot poisoning which is the same type of fungal poisoning that historians theorize caused the women to be accused in Salem. The ergot fungus can grow when ryegrass (used on most athletic playing fields) sprouts a floweret that gets infected. That infection usually occurs during the wet spring or in low lying, marshy areas and most often happens during wet spring months and on low-lying or marshy areas. Tremblay lives next door to a field of ryegrass and some of the ill girls have spent time on a ball field at the school. A new law went into effect in May of last year that bans pesticide use on school grounds which may have allowed the ergot fungus to spread. According to a report from the New York State Department of Health released Friday, the first case in LeRoy was also in May. Update 2-13-12: Bob Bowcock, a member of Erin Brockovich's team investigating the possible environmental connection to the LeRoy neurological illnesses, says that the TCE chemical spilled in the 1970's train derailment have not reached the LeRoy Jr. & Sr. High School. He did, however detect methyl tertiary butyl ether (MtBE) in one four wells tested near the school. MtBE is a chemical used in fracking. Although he does not feel this is the cause of the Tourette's like synptoms being experienced by over a dozen local residents, he also says that ruling out an environmental cause at this stage is irresponsible. He says it may take until summer to complete their investigation. "Preliminary test results indicate three private groundwater wells tested by Bob Bowcock, Environmental Investigator associated with Erin Brockovich, indicate the TCE plume migrating from the 1970 Lehigh Train Derailment has not moved toward the LeRoy Jr. & Sr. High School. "This is good news", said Bowcock, "it is one of the many areas we are investigating where we are able to reprioritize so we can focus our attention and resources on other environmental concerns". Bowcock has said many times his investigation is looking at a myriad of environmental concerns, including; the natural gas wells on the school grounds, fill material used at the school, the routine complaints of fumes or odors in the school vent system, the storm water system and sports field biological and chemical concerns. "When we arrived in LeRoy it was to conduct a very preliminary site assessment, a true investigation will take well into the summer months", said Bowcock. Unfortunately, later in the day as he was being shown around the community by a half a dozen of the parents of affected children, he happened upon the mess left behind at the derailment site by the contractor hired to remediate what amounts to the largest TCE spill in the system for the United States Environmental Protection Agency (USEPA). "What we found was astonishing; approximately 100 barrels that had rusted away and leaked back into the environment left in an enclosure overgrown by weeds". "All aspects of the derailment spill cannot be ruled out as I remain concerned about the use of fill material from the site as well as the levels of TCE reported recently in the adjacent aggregate quarry by the New York State Health Department", Bowcock said. "If 5 ug/L TCE remain in an open water quarry, 41 years after the spill, the source must be magnitudes more significant then I would have originally thought". Sites like this will take over 500 years to clean up. "Too bad this site seems to have been forgotten and/or somehow mismanaged; it will be hard to tell what ultimate environmental impacts could have been avoided", Bowcock said. "Erin and I are committed to investigating the environmental impacts on this community for as long as it takes to rule out all environmental concerns." The preliminary test results may have revealed another environmental problem in LeRoy...groundwater contaminated by methyl tertiary butyl ether or MtBE. MtBE is a suspected carcinogenic by the USEPA and manufacture exclusively by the petroleum industry. MtBE was banned in New York beginning Jan. 1, 2004. Under the legislation, the law prohibited gasoline containing MtBE as an additive from being imported, sold, dispensed or offered for sale in New York. MtBE is used in the cocktail of chemicals for hydro fracking natural gas wells in the LeRoy area. "I do not think this an environmental concern for the symptoms presented by the affected children, but I am concerned with the finding as MtBE moves faster in water than any other chemical in the fracking chemical soup, and could be the first indicator of things to come." Update 2-27-12: USA Today is reporting that two of the girls are cured and 3 more are on their way to being cured. This comes as the school begins a 7 week testing of air and soil to help alleviate parent and student fears about their safety. ""There are two of the girls that are all better, and there are three more that are just there," McVige said. Now the big picture of conversion disorder and mass psychogenic illness, the Dent neurologists' original diagnosis, is coming together, she said. Conversion disorder, a psychological condition with no organic cause, can happen when a person is subjected to stress or trauma. It also can be contagious, with one person unconsciously mimicking symptoms he or she sees in someone else. "What we do believe is that there may have been one or two index cases who truly had tic disorder or Tourette disorder and then there was an individual who came after that was most likely good friends with this individual that developed symptoms." McVige said the likely index case is not one of her patients. Update 7-3-12: The LeRoy Central School District has announced the results of the environmental testing that was done on the school grounds in a letter from Superintendent Kim Cox and it is good news for all. You can view the statement regarding the air, soil and water surface testing of the Junior/Senior High School building and grounds by Leader Professional Services. Leader concluded that there are no adverse health impacts from contaminants in the air, soil or water in or around the high school campus. The letter from Superintendent Kim Cox also says that their students are doing well. On June 24th some of the LeRoy girls graduated form high school in what must have been an emotional moment. The best news is that their treatment for Conversion Disorder has helped them. All questions about the report should be directed to Bill Albert. You can find his email on the LeRoy school district website. Update 7-16-12: In what I can only describe as irresponsbile reporting, Anderson Cooper in reporting on one of the afflicted girls named Marge, is reporting that, "Given the still relatively unknown circumstances of the illness, many people are frightened that Marge is contagious. Others simply can't handle the changes Marge is going through because of her condition." The only thing wrong with that is that we do know what the illness is. It is conversion disorder. I genuinely feel sorry for the afflicted girl, Marge, but from following this story for months, there seems to have been no stone left unturned in trying to help the ill girls. Take a look at the entry on 2-27-12 and seee if you have trouble understanding the reported cause of the illness. I have gotten a ton of traffic from this post and all I can think is that Anderson Cooper, who is obviously a much more qualified reporter than me and should know better, has succumbed to pressure from the network to pull in high ratings from the LeRoy girls. I will keep you posted if there is anything else to report. Update 8-14-12: In what can only be described as odd, or a publicity stunt, Erin Brockovich is returning to LeRoy for Q&A on what has already established as conversion disorder and not a mysterious illness. "In a flier obtained by News10NBC, Brockovich says she hosting a meeting "to update and to answer questions concerning the findings in LeRoy. Everyone is welcome to come and share your concerns and get clear and honest answers to your questions." Update 3-29-13: I noticed an increase in traffic to this post over the last few days and felt a familiar knot in my stomach. It is the same feeling I would get last year when a television "news" show or a website continued to report that the poor girls in LeRoy who suffered form the Tourette'slike symptoms of conversion disorder, were actually still undiagnosed. I followed this story initially because I wondered if the Gardasil vaccine was to blame but quickly realized there was no connection - just as there was no connection to environmental toxins. There is no mystery here. Read the diary above and I hope that attention seeking websites will leave these poor families alone and move on.